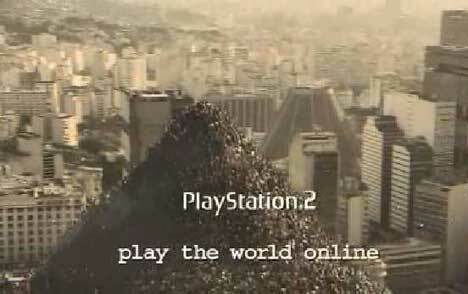 The worldwide community of Sony Playstation 2 was promoted in 2003 with “Mountain”, a 60 second ad shot in Brazil, capturing the nature of competitive community, inspiring some, bemusing others. A man sits on top of a high building, with the sound of a siren in the background. The camera zooms in to a neighbouring building, with a swimming pool on top. By the pool stands a man in his swimmers, looking up to the camera. Down on the street pedestrians and passengers are also looking up. 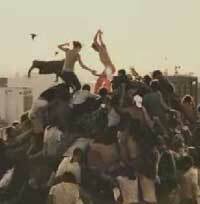 People start to run and climb, forming a seething mass of competitors vying for the spot at the top of an office block. 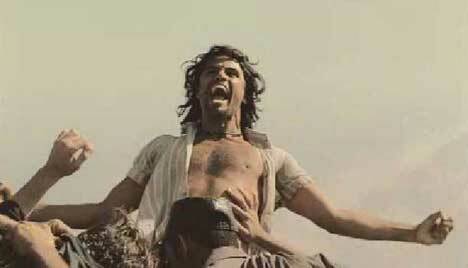 As ‘players’ reach the top he exults before being thrown down the heap. The text: Fun Anyone? Playstation 2. Play the world online. The ‘Mountain’ ad was created by advertising agency TBWA, London, by creative director Trevor Beattie, copywriter Paula Marcantonio, copywriter/art director Tony McTear, and agency producer Kate Hitchings. The brief they were given was to show people competing to be the best – showing the capacity of the new PS2 to introduce players to a worldwide competitive community. The team came up with the ‘King of the Mountain’ game as the basis of a huge crowd experience. Director Frank Budgen worked with the team at Gorgeous Enterprises, London, including producer Paul Rothwell and director of photography Marcelo Durst. The ad was filmed in Rio de Janeiro, Brazil. Local production service company Zohar International recruited 1500 extras including stuntment, gymnasts and circus performers. Zohar were the key to organising the production of the office buildings on the side of a mountain. Post production was done at The Mill, London, by producer Liz Browne, 3D artists Jordi Bares and Ben Smieth, Flame artists Barnsley, Jeff Robins, Richard Betts and Daniel Morris, and colourist Adam Scott. Sound Design/Arrangement was by Peter Raeburn, SoundTree and Warren Hamilton, Wave Studios, London. The soundtrack to the clip is Shirley Temple singing “De Gospel Train” in 1936. It’s from the movie, Dimples, in which Shirley plays the grand daughter of a pickpocket in 19th century New York City.